This recipe came about by accident. I had planned on making a beef version of the filling in my shredded pork burritos but had managed to grab the wrong heat level of diced tomatoes and green chiles. I had a can of chipotles in adobo on hand for another recipe and decided to use that instead of diced tomatoes and green chiles since I liked the way they tasted in Chipotle Pulled Pork with Caramelized Onions. It turned out great and this will be a base recipe I use for many different dishes. 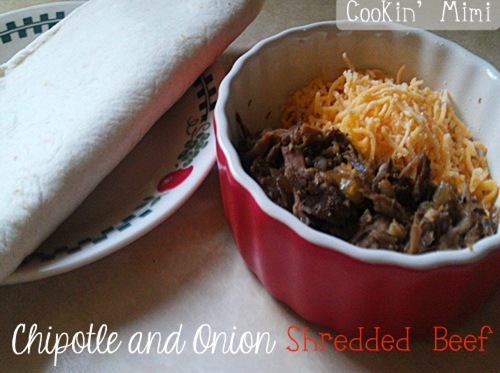 I’ve got a couple on new recipes utilizing the chipotle and onion shredded beef coming up pretty soon. Sprinkle both sides of the roast with salt and pepper. Place seasoned roast in the liner of a 4 to 6 quart slow cooker and top with onions. Mix together the chipotles in adobo, beef broth and garlic. Cover and cook on low for 6-8 hours or until fork tender. Shred and serve as desired using juices if needed. Thanks for stopping by. I love to hear from my readers so comments are welcome. I have over 100 more recipes in the index if you want to check them out. Did you know you can sign up for updates via email or RSS? It’s free and easy.